We have a large collection of 500 different types of Soups. Yes, it's clearly evident that Veg Soups and the different types of Indian Soup recipes are super popular all over India. Depending on how it is made, with what, and when it is served, a Indian soup can be anything – snack, starter or even a full meal by itself! The term ‘appetiser’ is just apt for soups, as the consistency and the spicy notes of a soup kindle your appetite and shake awake your taste buds. Apart from serving them along with the starters, there are more ways in which you can enjoy the unending variety of soups. Serve classic soups like the Cream Style Sweet Corn Soup or Clear Veg Soup with dinner rolls and pasta to make a sumptuous continental meal. Thick and nourishing soups like the Barley Soup or Moong Soup can be served as a meal, along with croutons or bread toast. If you’re hungry at odd hours, you can always go for a chunky, multi-textured soup with rice or noodles in it, to keep you satiated for a decent duration of time. Indian Soups, Shorba – the true appetiser! When it comes to the job of appetising, nothing performs better than Indian veg soups, also known as shorbas. These are generous with the spices, and leave a really warm taste on your palate. In fact, when you are down with a cold, a spicy Indian shorba is just what you need to reenergise yourself. It’ll tear through the damp laziness and go right to your heart, to warm and cheer you up. Go for a round of the ever popular Tamatar Shorba or South Indian Rasam to experience the zesty magic of Indian spices. one dish meal Indian soups. Don’t feel like having a heavy meal? You can always go for a meal of soup and toast. Thick and creamy soups, as well as chunky ones, are quite effective in satiating your tummy. Thick and creamy soups are very comforting. It’s something that it totally relaxing – just sit back and slurp, without even bothering to bite! When had in substantial quantities, a thick and creamy soup can be a satiating meal. While these soups were traditionally thickened using corn flour, now there are myriad options like thickening with plain flour, powdered oats or cream, each offering a different flavour and texture that will please your palate. Take your pick from all-time favourites like the Sweet Corn and Spring Onion Soup, Cream of Potato Soup, Black Bean Soup and Cream of Spinach Soup. When you are eager for more variety, go for excitingly flavoured, multi-textured Chunky Soups. These are usually semi-thick and have chunks of vegetables, beans or noodles that play with your taste buds! Soups like Corn Chowder, Manchow Soup, Cream Style Sweet Corn Soup, Nourishing Barley Soup and Hot and Sour Soup are quite filling, and have a very interesting mouth-feel too. Try the Moong Dal Soup once and it will soon become your comfort food! clear Indian soups. When you need something light and refreshing, look no further than clear soups. Apart from the classic continental clear soups made of vegetable stock, crispy veggies, corn or mushrooms, seasoned slightly with salt and pepper, there are also many invigorating oriental clear soups that are laced with peppy sauces. To get a taste of clear soups, go for classic recipes like the Mixed Veg Clear Soup or Chinese Vegetable Clear Soup. When you’re feeling more adventurous, go for the Tom Yum Soup or Kokum Saar. quick Indian soups. All of us experience times when we desperately need a bowl of soup but have neither the time nor energy to make one. Even if you have a couple of minutes to spare, you can make yourself a Jhat-Pat Soup, without much ado. Ready in a jiffy, soups like the Broccoli Broth, Whey Soup and Lemon and Coriander Soup are very effective in rebooting the day without expecting too much effort in return! Indian jain soups. Did someone tell you that you can’t make tasty soups without onions and garlic? Prove them wrong and convince yourself with these awesomely tongue-tickling Jain-friendly soups. Soups like Tomato Shorba and Moong Soup delight your palate, even without using ingredients like onions, garlic and potato. With ingredients like tomato for tanginess, spices for flavour, and herbs for aroma, these soups win hands-down! When you’re aiming to lose weight, or on a day when you feel heavy, there is no point in gulping down a heavy soup laden with potatoes, cream, corn flour and other calorie bombs! Soups can be made low-calorie yet super delicious. Experience the benefits by shifting to low-cal options like Carrot Soup, Healthy Lentil Soup, Nourishing Barley Soup, Whey Soup, Chinese Vegetable Clear Soup, Moong Soup etc., which will give you the same delightful experience without any guilt. Enjoy these easy-to-digest yet sumptuous soups hot and fresh! Name your mood and there’s a soup to match. Whether you need an appetising start to your meal, a pick-me-up when you’re down in the dumps, a quick soup to please a guest, or a sumptuous soup to serve as a meal, there is something to match every need. A soup is like a friend in need – an effective mood-changer, a soul-searcher, a nourisher. So, never cringe to spend a few minutes for making a bowl of soup – it’s worth every second! 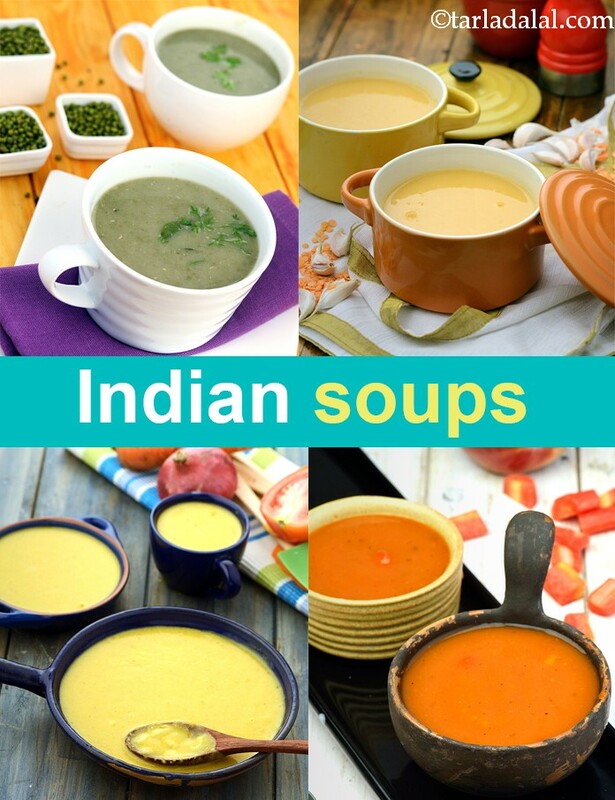 Enjoy our Indian Soup Recipes, Veg Soup Recipes below and other soup articles. Moong soup, subtly flavoured with curry leaves and lemon juice, this moong soup is easily digestible and high on energy. Carrots and paneer increase the protein and vitamin a content making this soup a great starter to meals. Time for some green fun! the celery soup with dill is a lovely green-coloured soup of celery pepped up with aromatic dill, onions and a dash of pepper. Milk and corn flour help to balance the flavour as well as lend the perfect consistency to this soup. This unusual yet delicious combination of lettuce and onions is sure to become a firm favourite and help restore your B-complex vitamin levels as well. Though just pepped up with salt and pepper, it's sure to tingle your taste buds. Tarla Dalal Thanks for the feedback. We are delighted you liked our soup collection.